The SeaSketch initiative highlights key components of successful citizen science projects. The end product is a result of an iterative process where the developers applied previous successes and learned from mistakes. The tool was designed to allow people without technical training to participate, expanding access to stakeholders. MarineMap had a quantifiable impact on California marine protected areas, increasing their size from 1 percent to 16 percent of the coastline. The subsequent version, SeaSketch, is uniquely suited to scale out worldwide, addressing coastal and land management challenges. By emphasizing iterative development, non-expert accessibility and scalability, SeaSketch offers a model of successful citizen science. In 1999, the state of California passed the Marine Life Protection Act (MLPA). The MLPA mandated that the state evaluate all current marine protected areas (MPAs) and prospectively create new ones to function as a coastal network. Coastal management is a complex process involving multiple stakeholders: Diverse groups have both economic and personal interests in the ocean. For the MLPA to achieve its goals, it needed a functional spatial decision support system that would allow citizens across the state to help design and collaborate on MPAs. Geographic information systems (GIS) offer the necessary map functions but are traditionally limited to those with advanced training: This marginalizes stakeholders who are not specialists. The solution was to develop a participatory geographic information system (PGIS) enabling community empowerment, wider data access, public participation and better inclusion of local knowledge. The first iteration of this project was called Doris, released in 2005. Doris was a web-based platform allowing users to sketch prospective MPAs and receive feedback on their recommendations with respect to MLPA guidelines and scientific considerations. Doris educated the team on top priorities for the new version. The software was slow and unstable, discouraging stakeholder participation. Doris’s data capture and reporting elements were not intuitive and difficult to use. At times, staff relied instead on desktop GIS, breaking the planned workflow. Work began on another version. The result was MarineMap. The software made significant adjustments to encourage non-technical use. 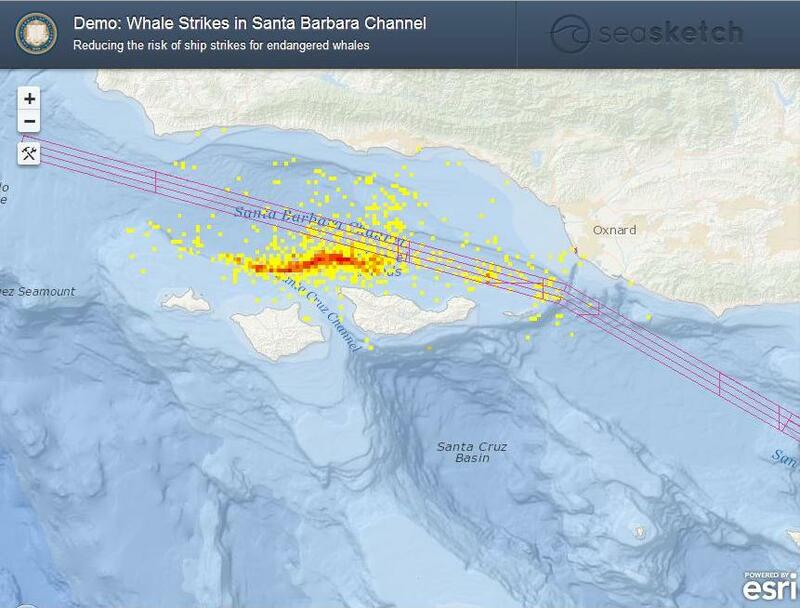 MarineMap was more stable, faster and prevented the results graphically instantly, not in a table. At public meetings, this interactivity and rapid engagement created a healthy dialogue. The software was intentionally outward facing. The software was used throughout the MPA process, and more data was gradually layered over the base map to reflect stakeholder input. Upon completion of the MLPA, the portion of California coastal MPAs had risen from 1 percent to 16 percent. The current iteration of this PGIS platform is SeaSketch. SeaSketch continues to prioritize maximum accessibility and engagement: lowering technical barriers to include more people. Beyond more participants, marine planning activities need better data. SeaSketch allows users to conduct spatial surveys—share what they know about what happens in the area. The software is scalable and has projects in process for PlanetWhale, the National Oceanic and Aeronautic Administration, the United Nations Environmental Project and more. SeaSketch can also be used for cooperative agreements. Applied on the high seas, parties do not have enforcement authority. Instead, they can set community standards—scenarios can be rapidly gamed to gauge priorities. Research is ongoing to develop use metrics: to adjust development based on how the tool has been employed. The SeaSketch team also believes that the unique nature of the tool could allow it to move beyond oceanic issues. With proper analytics and adjustments, it could help with freshwater and land management planning. SeaSketch provides powerful motivation for participation by continuing to make the tool user friendly and easily accessible. Being a web-based software means it requires no additional downloads or plug ins. The team also has made it easy to post SeaSketch to social media, enhancing opportunities for exposure. They acknowledge that outreach is an ongoing process. The continued utility of the tool will depend on regularly investing in public engagement and education. The flexibility of SeaSketch means they can motivate participants interested in a diverse set of issues. The original project dealt with managing MPAs, but ongoing versions deal with different problems, including energy independence and collaboratively planning shipping routes. SeaSketch currently has four full time staff members housed within the University of California at Santa Barbara. Two are developers, providing dedicated support to the software. One staff member works exclusively on planning: He focuses on stakeholder engagement and interfacing with users of SeaSketch. This includes planning client education developing education modules. The team has gradually developed best practices on structuring end-user engagement, and this experience has been helpful for clients. As the project scales out, they anticipate they will need more in-house development to support the expanding list of planning processes. While they have enough staff to support the core back end, contract staff may be helpful to develop the unique analytics and reports for different regions. Iterative Development: The current version of SeaSketch’s PGIS software is the result of seven years of trial and error. Doris and MarineMap helped the project team learn what worked and adjust accordingly. The final result would have been impossible without a sustained commitment to the project and regular product assessments. Non-Expert Accessibility: GIS software is traditionally limited to those with technical expertise. SeaSketch was developed anticipating that stakeholders without GIS training would use the software. New features allow users to contribute spatial surveys, sharing their knowledge of the area to better inform planning. This ease of use means the project is outward facing: More people can participate, meaning the analyses better reflect community priorities. Scalability: Although MarineMap was built specifically to guide the MLPA process, the concept is highly flexible. SeaSketch is being used to support oceanic management issues worldwide, including in areas of international jurisdiction. The software can support planning with legal implications as well as cooperative agreements. SeaSketch’s project team believes it can also be used for freshwater and terrestrial management issues. Zachary Bastian is an Early Career Scholar with the Commons Lab and the Science & Technology Innovation Program at the Wilson Center, a member of the New York State Bar Association and a graduate of George Washington University Law School. He previously worked in the U.S. Senate studying policy and supporting the work of personal and subcommittee offices. His interests include intellectual property, communications and leveraging technology to support better government.